This year has been difficult with my mother dying, an appendicitis surgery and other life challenges. Throughout the year, my mind pondered on Psalm 23’s help and hope. This psalm has a lot of encouragement for you. God’s presence and power in the person of the Good Shepherd. This hope makes all the difference in dangerous, difficult, desperate, debilitating, depriving and death-filled situations. Psalm 23 is about you as His child experiencing pain, heartache and trial with God’s great comfort to aid you. He laid down His life and rose again from the dead for your salvation (Hebrews 13:20-21). have made a mess of your life. “All we like sheep have gone astray” (Isaiah 53:6). This Good Shepherd Jesus Christ wants you to enter into His flock through the door. To do this, you must take Christ as your Savior and Lord. You must recognize your thoughts, motives and actions miss every time His standard of glory. Your sinfulness is known with this attitude: “I will park in a no parking zone, because I want to.” Also your actions and attitudes are completely polluted with sin. Yet Jesus as the Good Shepherd beckons you to go through the door and embrace Him as Lord and Savior for your sin. Then you will experience forgiveness and be part of His flock. 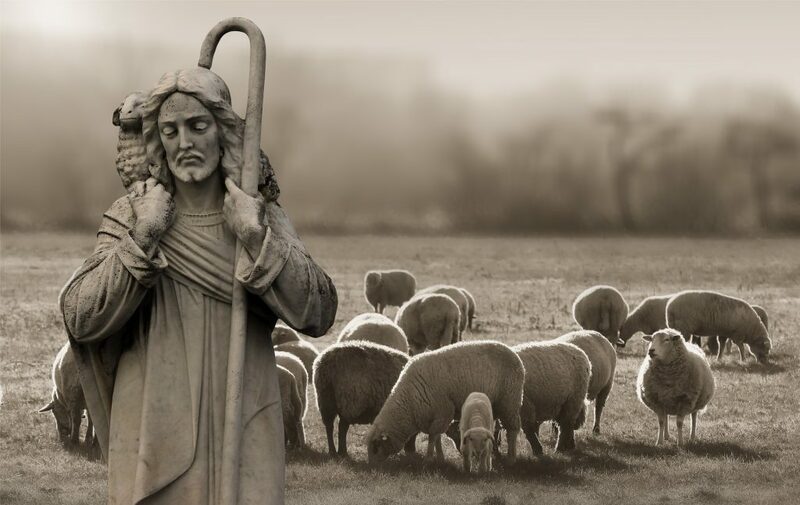 Maybe as a Christ follower, you have a hard time saying: “The Lord is my Shepherd.” You may be responding to people, circumstances or God not as one who delights in the Lord. In your mind, suffering and pain have no purpose for your life. How can you take delight in the Lord? You delight in saying He is my owner. “The Lord is my shepherd.” You delight in your Shepherd managing your thoughts, actions and attitudes. Your Shepherd truly loves you and puts fences into your life, so that you don’t go astray into sin. Jesus the Good Shepherd knows what is best for your life in bringing pain and suffering. He’s not unfair and will do what is right for your life amidst hardship. He is always good, gracious and kind when keeping you in His good pasture. His commands are not burdensome. embrace the Gospel. This Shepherd reminds you of His unmerited and transforming grace for your life. The phrase “the Lord is my Shepherd” also indicates: He is my leader. As a Christ follower you have a great, good and gracious Leader who wants to guide your life. You are a sinner needing His help and favor for your life. He will certainly lead, guide and direct through danger, difficulty, disaster and death into His good pasture. He leads and uses the good and the bad to conform you to be like Christ (Lamentations 3:37-38, Romans 8:28-29). What’s this all about? Let me state it this way. When the Lord is your Shepherd: You certainly talk about Him, but you also must talk to Him. What I learned is that it is good to talk about your great, good and gracious Lord to other people, but don’t talk too long without you talking (praying) to your God. As a Christian, you are to be a theologian—that is, a person who understands the character and ways of God from the Bible and then put them into words. You should want to help others and give hope by talking about your gracious, great and glorious God. That’s good, but you should interweave your theology about God with talking to your God with praise. Not far behind “God is generous” should be praise: “You Lord, are so generous to me and others. Thank you.” On the heels of “God is glorious” should be words of worship: “I adore your fame.” Good theology about God and praise to Him work together. Good theology about who your Shepherd is and what He has done for you should drive you to a good emotional response! Good theology drives your emotions into the right path! withhold no good thing from those who walk uprightly.” When you think of lacking nothing, you could think God will always shower material, financial and physical blessings on you as a godly person. However, some real godly people had difficulties in the Bible. Upright Job lost his wealth, children and health. Paul was stoned to death, beaten, spent a night and day in the sea and had a thorn in the flesh. Jesus had to sleep with the foxes and wild animals. Other believers were mocked, flogged, imprisoned, stoned, sawn in two, killed by a sword and afflicted for the Lord while looking for something “better” (Hebrews 11:36-40). God has blessed some of you with wealth. If you have wealth, that does not mean you are ungodly. You just have to recognize there are uncertainties with riches—earthquakes, floods, hurricanes and downturns in the economy and stock market downturns. You can’t think like Nebuchadnezzar and look at the kingdom you built. You can’t place your hope in wealth. You have to learn how to use the wealth God has given and use it for others good and God’s glory. You acknowledge God is the source of your wealth. You are dependent on Him for life, health and wealth. Realizing this will make you see you lack nothing, because you have Him. Others may lack money and know what it is to have your back against the wall. You have no way out, but you look up to Him. Being financially in want doesn’t mean you are less godly. He’s just creating a dependent spirit on Him where you cry out to a God who is gracious, kind, good and wise for your needs. “The Lord is my Shepherd, I shall not lack” also means you shall not lack anything in life as a believer, because He is all you need. The chief end of man is to glorify God and enjoy Him forever. When I have Him as my Lord and Shepherd I lack nothing! You can say even this when facing the inequities of life and evil getting the upper hand. Listen to Psalm 73:25: “Whom have I in heaven but you? And there is nothing on earth that I desire besides you.” You could be stripped bare of everything in life, but you still will have the real treasure—the Good Shepherd!